40% of Native Americans live in sub-standard, overcrowded housing. PWNA is a nonprofit with eight programs for poverty-stricken reservations: American Indian Education Fund, Northern Plains Reservation Aid, Southwest Reservation Aid, Navajo Relief Fund, Southwest Indian Relief Council, Sioux Nation Relief Fund, Native American Aid, and Reservation Animal Rescue. PWNA provides the administration, accounting, and fundraising for these programs, over and above the actual material aid, education, and relief services. PWNA is not a third party, and you may restrict your contribution to your program of choice simply by writing "Restricted" on your check or return form. This way, 100% of your donation goes to your program of choice. Please see our Directors and Key Staff page. Yes, PWNA is a 501(c) (3) tax-exempt charity. Our Federal Tax ID is 47-3730147. An independent, certified public accountant firm, as described by the IRS, prepares our Financial Statement and Audit. Your contribution to PWNA is tax deductible. We work with reservation programs located in our priority states when they request our services, provided their programs fit with our offerings and guidelines. We emphasize services for the most vulnerable — the Elderly and the children. Many of PWNA’s services can benefit these populations, providing food and healthcare items to practical holiday gifts and school supplies. What we provide depends on what will meet the specific needs of each Program Partner and their community. In other words, we strive to get the right goods to the right people. PWNA is an accredited charity that meets all 20 of the BBB Standards for Charity Accountability. More than 70% of revenue goes toward programs. Please access our most recent IRS Form 990 and Annual Report to obtain a complete financial picture and the impact our donors’ gifts created. What about the money made from casino and other gaming operations? Contrary to popular belief, among the 566 tribes in the U.S., fewer than 15% operate prosperous casinos (72-74, according to the National Indian Gaming Association). PWNA serves reservations with the highest need in the U.S. In fact, the research shows that casinos need to be within 50 miles of a metro area (with 10,000 or more residents) to be highly profitable. In our experience, the rural casinos do not have enough traffic to generate large profits — the casinos do create a few tribal jobs. Some of the tribes with profitable casinos do help other tribes, but even that is regulated by the government. Please visit the official website for the Department of the Interior at www.doi.gov or www.ancestry.com. Learn more on our blog. Please visit the official tribal website of the tribe or reservation that you would like to visit. You can also learn more on the PWNA Blog. Because we serve entire groups, such as every Elder at a Senior Center, we need items donated in bulk quantities and in like kind. For more information on donating bulk items such as new toys, clothing, school supplies, or other needed items, please call our Donor Relations Department at (800) 416-8102. PWNA is an Equal Opportunity Employer. We do not discriminate on the basis of age, race, or gender. Every position is filled with the most skilled candidate for the job. We have a diverse staff, including Native Americans and we encourage Native Americans to apply for any opening we advertise. One-third of Native Americans live on the reservations. They are free to leave the reservations, but leaving family behind is difficult for many. Family is very important to Native Americans and, for most, their reservation is "home." 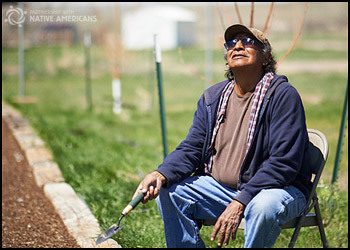 All of our Chairpersons are primarily Native American Program Partners who share the needs of people living on the reservations, as do the 1,000+ Program Partners we work with year-round. They advise us on the changing needs of the people and help us portray conditions accurately and respectfully in our messaging to donors.